Well, it's official. I have been meaning to write an update but I was so focused on opening my gallery and spending time in the Violet Fern garden, that all else fell by the wayside as I sped along on my path ferrari-like. And, oh what a good feeling to have the wind in my hair, the past behind me and the dust rolling. So, how did the opening go? Well, it went very well. Not as expected but very well. I haven't any complaints and my enthusiasm and excitement still burns bright. Not as expected: the number of people coming through. That expectation was much higher not because of the gallery, but because the NNY Art Trail Open Studio Weekend that we (my business partner and I - well, mostly her because she is the extrovert in this little operation and I am the introvert) advertised on radio, in newspapers, even on local television didn't seem to catch fire. For all that advertising, many of the artists across the board didn't get the traffic we expected. So, we regroup on that event possibly moving it to mid-summer when most of the towns are full of tourists. And also it is only the first year of the event and the trail itself. Don't know what I'm talking about? 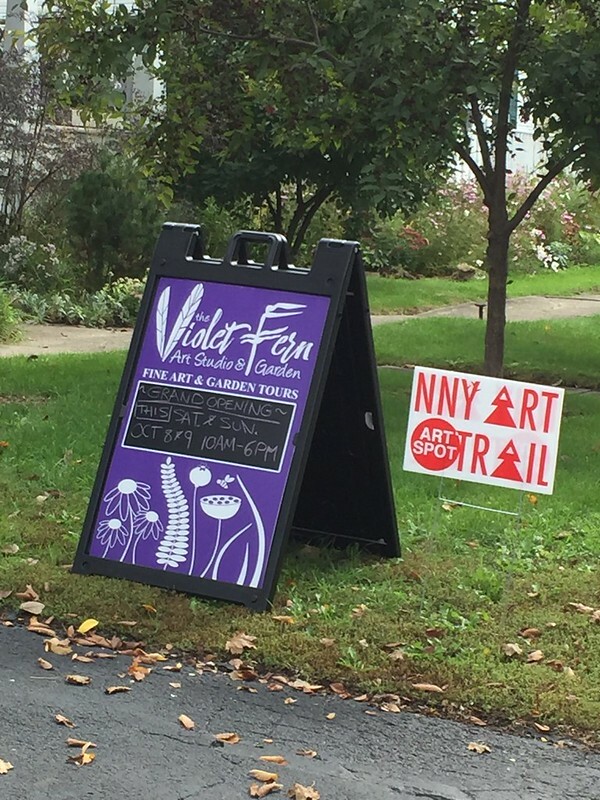 My partner and I organized a Northern NY Art Trail that is open year round (not just for a weekend event). 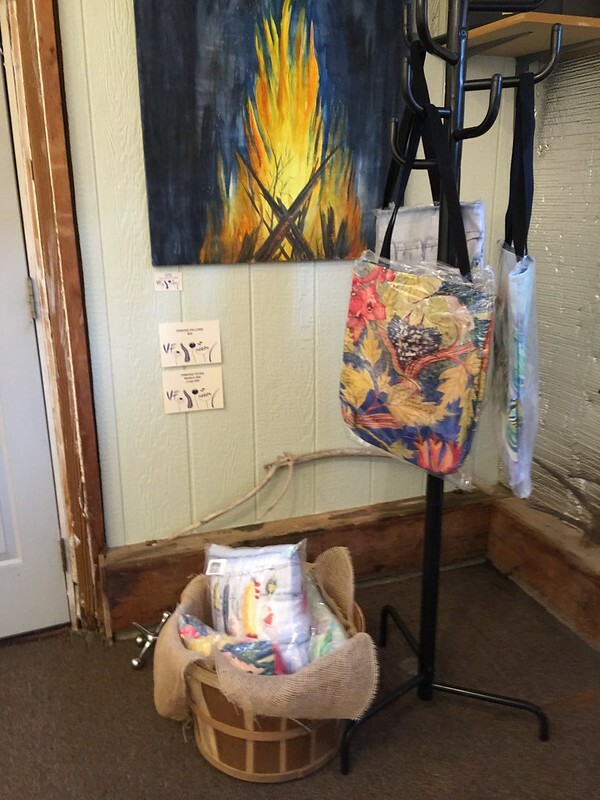 The idea is to draw attention to local artists in our community. The trail is wide — encompassing three counties in the Northern NY area. This Open Studio Weekend event was to promote the trail but honestly I think we confused people with the year round aspect and the weekend event. You can learn more about it here. I decided to hold my grand opening during this event well, because it was already publicized. Ideally, I should have been open in the Spring as an active member of the trail but honestly, no one really noticed or contacted me about being open. Anyway, I am very pleased with my sidewalk sign. I designed the art but Stewart Signs did a wonderful job creating it and adding a little chalkboard section so I have more flexibility. Until Thanksgiving Day (when I leave for my winter home), if the sign is out, I am open! You can always call to make an appointment, too. I am very happy to accommodate you. Beginning next May 2017 I will have regular hours. They will be Monday through Thursday from noon to 6pm. Look for my ad in our local paper, The TI Sun. ​ Mentioning papers, the Watertown Daily Times was here for my grand opening, and also at other stops on the NNY Art Trail, and wrote this article. Kari, my business partner, also wrote this article for a local publication. 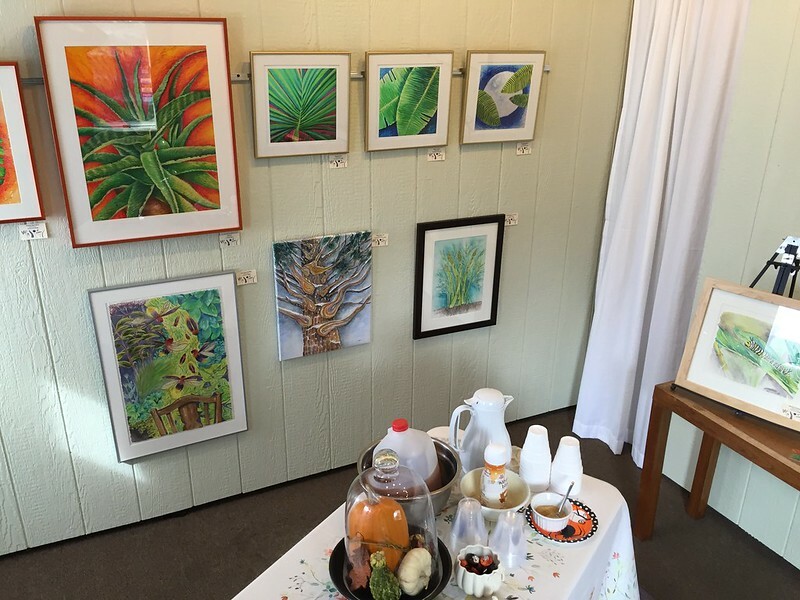 So, what does my gallery space look like? Photos below. It is very creatively carved out of our detached garage and probably needs a little more refinishing but it is a place to start. Two of the paintings you see here were sold. 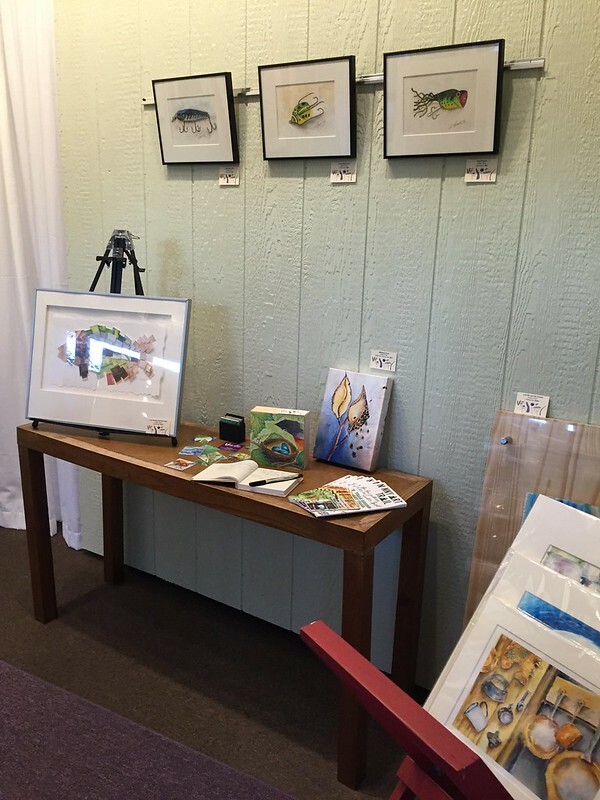 The collage of the fish on the table top easel, entitled "The Painting That Got Away," and the stretched canvas print of the "Milkweed Pods" also on the table to the right, have happy new homes. The table was actually built by my Grandfather and I have had it for years. The small stand holding prints to the right was also given to me by a very dear person and I am so grateful to her — thank you. I served up treats all weekend — coffee, cider, donuts. Later in the day a homemade almond cheese that is dairy free and "Summer in a Jar" with cherry tomatoes, garlic and basil all grown from the Violet Fern garden. I illustrated "Summer in a Jar" for They Draw and Cook a few years ago, a wonderfully fun web site in which all recipes are illustrated. I sold that original illustration, but you may order a print of it from their website. Simply search under "find a recipe" for artist Kathy Sturr. These "walls" are actually attached to large shelving units we use for storage in our garage. The white paneled curtains provide secret doors to the rest of the garage. There is track lighting above to light up the paintings. The walls are painted "Moss White." I also stock tote bags and pillows with my art printed on them. Two of these pillows sold as well as the tote with the hummingbird nest on it. Yes, I need to work on the door — it could use some new trim and a fresh paint job. Our garage is fully heated and insulated. I suppose I could put up some more siding to cover up that half wall of insulation. That would certainly look better but you are supposed to be focused on the artwork! So, although only 17 people visited the gallery over the weekend, I sold quite a bit. In fact, I sold more in two days than I did all summer at the small gallery I belong to in Cape Vincent! Yes, I am very pleased. If you are far away and cannot make the trip to visit my gallery in person, you can order prints and greeting cards of my artwork, as well as pillows, tote bags and more right from this website! Just click on "SHOP." You can order a 9"x12" print for under $45, a pillow for $40 and a tote bag for under $30 plus S&H. Yes, I am shamelessly promoting myself! So, what about the garden? Did I finish all that I wanted to? No, hardly. Why I thought I could make up for three years of neglect in a little under a month, I have no idea. However, I did get quite a bit done and I cannot express to you the joy I found in reconnecting to my garden! I have been sitting on my new little backyard patio almost nightly with a huge smile handing out peanuts to the squirrels and bluejays. That big, predatory smile probably frightens them a little but not enough to pass up peanuts! We are getting used to each other again. I focused on the Potager where the paths area extremely overgrown. I can walk unobstructed to my she shed again! I have filled up nearly 20, (20! ), of those large lawn bags with weeds. I have resorted to bringing them to the dump where they have a compostable yard waste section because my compost pile — okay, let's face it we can't really call it that anymore — my personal geographic drumlin, is too large. 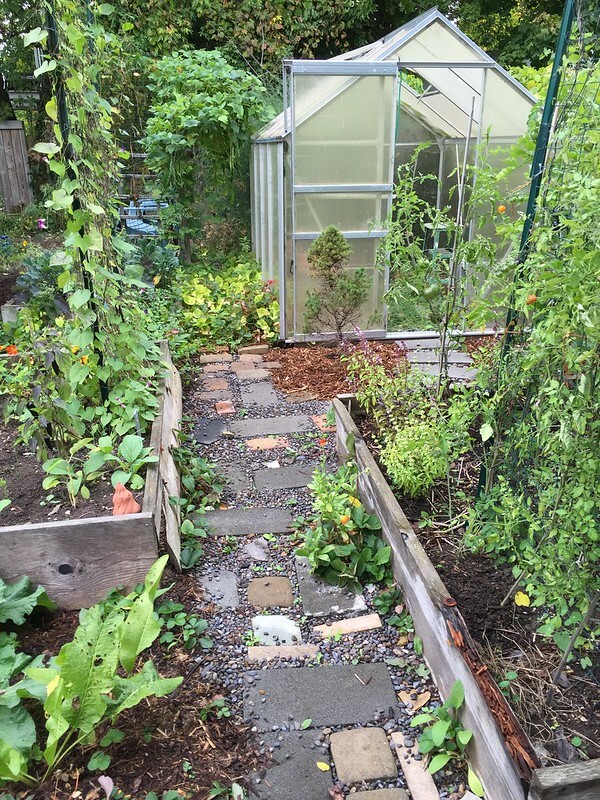 You can see where I stopped "weeding" the "path" at the line of the greenhouse. It is still a bit of a jungle out there, but getting there. Beyond the overhanging Runner Beans is the new patio — you can see a little of the green chairs. I will obtain some nicer chairs at some point in the future. Here, on the other side of the rustic arbor, the paths have been cleared and you can see the patio. Beyond that is the "drumlin" I plan to screen with some taller ornamental grasses: native Big Bluestem and Morning Light Miscanthus which I am going to move out of the Bird&Butterfly garden as it is struggling from the competition. In front of the patio I am designing a "river view." I don't live right on the river, it is a block away, but I love the idea of sitting on the patio and enjoying a river view. The river — you have to use your imagination here — is constructed with blue bottles and rounded stones. 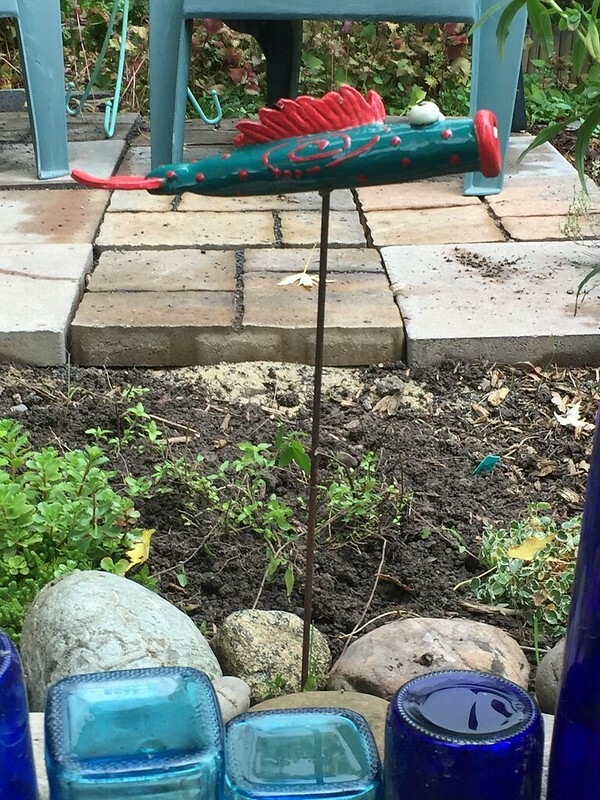 I have two wooden fish which I will be "artfully" painting this winter and mounting on rebar to swim through the river, in addition to this fun fish sculpture given to me by a friend years ago, thank you Sheila! 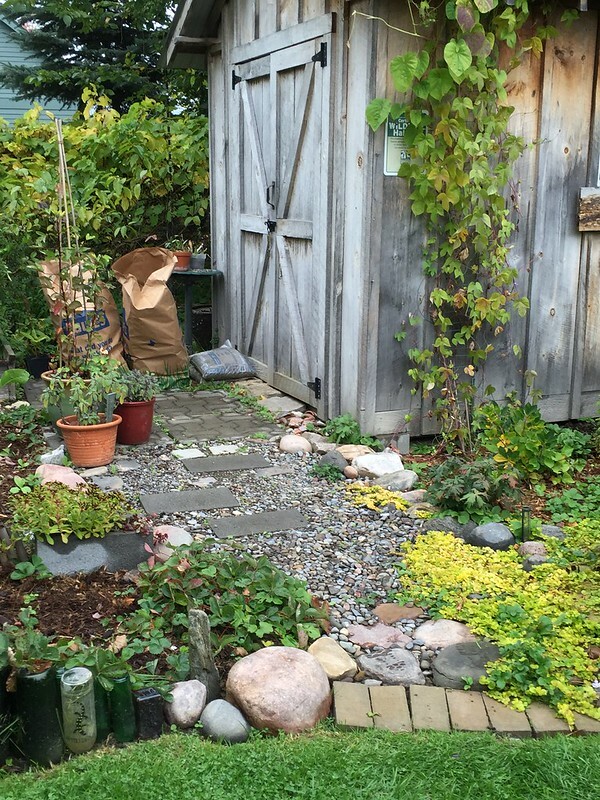 Between the patio and the "river" is an assortment of low growing plants: a mix of sedum, thymes, creeping phlox, golden oregano most "rescued" from my garden. I scored on a sweet little Burnet at our local nursery: Sanguisorba minor 'Little Angel.' My goal is an interesting "flow" of blooms, foliage, and scents. A planting that will be appreciated close up and in slow motion. I have also planted allium bulbs along the line of the river. 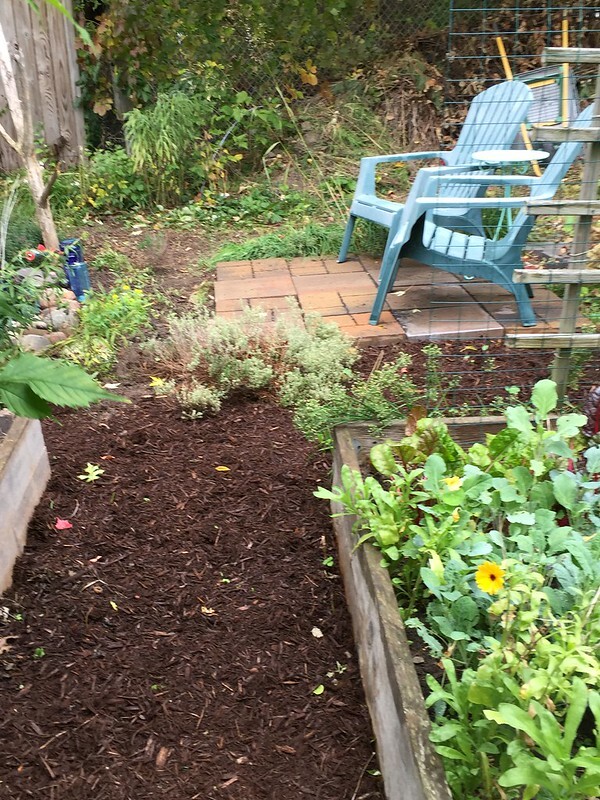 I think I will use pea gravel instead of mulch here to further the effect. This is my "river view" so far as viewed from one of the chairs. Behind the "river" taller plants like Sedum Autumn Joy, Yarrow, Lavender Hyssop, and Russian Sage (which will hopefully take) will offer "waves" of blooms. I also spread some Love-in-a-Mist and Sea Holly seeds that I hope will root next Spring. Birds alight on the bath, visit the feeder (upper right), perch on the "driftwood" as I sit and absorb the garden and what Nature I can. 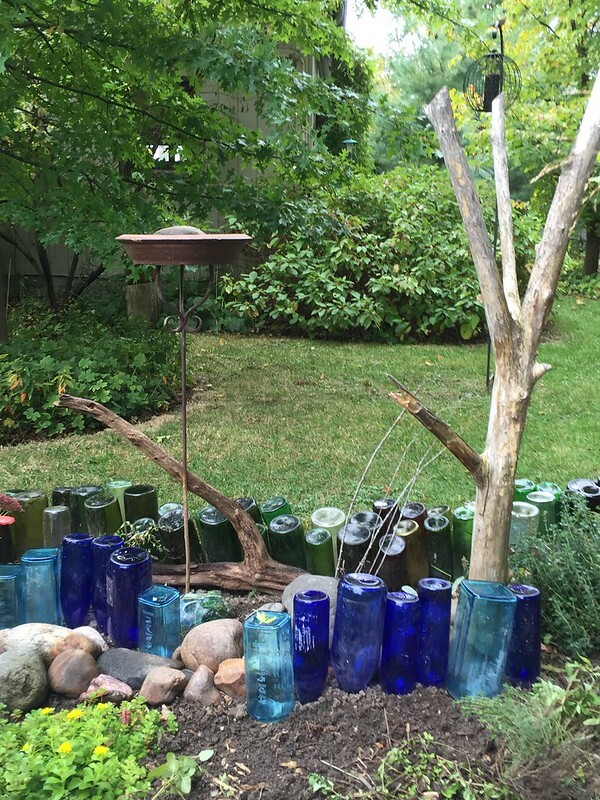 This is the kind of gardening I love: connected, creative, natural, personal. I have to return to the Park for clean up. Honestly, I have been putting it off because I am just enjoying this new "job" so, so much. I wanted to make my garden and painting my job, and this is what I am attempting to do. I pour my coffee in the morning and make out my list and smile, giddy, "this is now your job!" In the Spring, I will have a shelf in the greenhouse of plants for sale and possibly packets of seeds in the gallery also for sale. I also imagine pallets of larger plants for sale, all in addition to my artwork. If that is not enough income I will attempt to drum up some freelance illustration or graphic design work online, even though I hate to "muddy the waters." It is so rejuvenating just to focus on THIS. I am pleased with my latest artwork. I am creating a series of moth paintings depicting the moth, caterpillar and host plant in the painting. I have completed one entitled "Wooly Bear." I will be working on completing the second "Luna Moth" today. The third is "Regal Moth." I will be entering the first two in an upcoming local art show. I do hope to enter more art shows with my focus now narrowed. I'm super excited. If you haven't already, you can download September's free coloring page here. (October's is in the works.) Get yourself a nice warm spicy, pumpkin latte and color away! Stay up to date with what's happening. Sign up for my newsletter below.